It’s been a long time since I’ve used a PC without an SSD as the primary storage device, but I still rely on painfully slow USB connected spinning media to backup my data. So this review of the Plugable Thunderbolt 3 NVMe SSD is quite timely for me as I consider getting something comparable to the experience I’ve come to expect. There are a couple things that have held me back so far though: price and capacity. Which I guess is really one thing – cost per unit of storage. At CES, Plugable introduced its Portable NVMe SSD. Using the Thunderbolt 3 interface this solution capable of reaching 2400 MB/s read and 1200 MB/s write all while being bus powered, so no need for extra power. 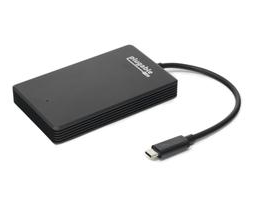 Plugable has designed the enclosure out of aluminum using a unique heat sink design while internally they have selected some proven components, the base being a Phison E7 powered NVME SSD.